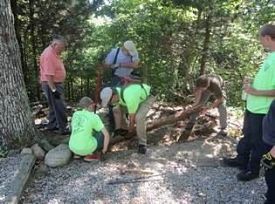 Mitchell Spell put his skills and expertise to use recently to complete his Eagle Scout project at Lloyd Center for the Environment. 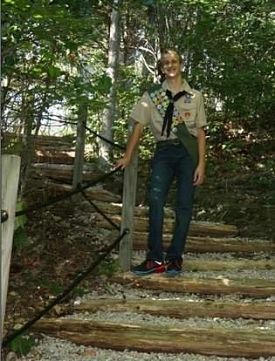 Spell, 14, is one of about eight young men in his Boy Scout Troop from The Church Of Jesus Christ Of Latter-Day Saints on Cross Road in Dartmouth. A few months ago, after earning his Life Scout ranking, the ninth-grader began brainstorming ideas for his Eagle Scout project. Spell, who has attended summer camp at the scenic Lloyd Center over the years, called the Potomska Road reserve to ask if he could make it the center of his Eagle Scout project. “It was perfect timing. They needed their stairs redone, and they had another trail that needed stairs,” he said. With a project now in mind, Spell began his planning. “I am a science kind of guy and we did fun experiments at the Lloyd Center summer camps, so I was happy to do my project there. The stairs were in really bad shape,” Spell said. The need for new stairs became a pressing matter after Spell received a phone call from the center. Someone had fallen and suffered an injury. “That elevated the urgency for the project. Those stairs get a lot of traffic,” Spell said. With the help of his troop members, family and friends, the project was kicked into high gear. Spell said that about 90 percent of the materials used for the stairs were donated. With the necessary resources and a determined group of people, Spell began his project on Labor Day weekend. “It took about two full days to complete,” Selena Spell said. 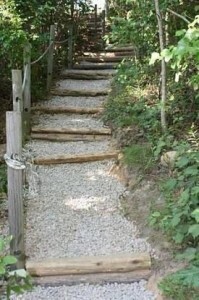 The labor consisted of replacing the old stairs along with adding another set of stairs on a separate trail. “They had to dig everything out, put down rebar, add rope for the railing and put stones along the edge,” Selena Spell said. Mitchell said he was “very much relieved” after the 60-stair project was finished. Mitchell Spell stands on one of the trails he recently helped to renovate. The primary trail leading down to the water now features replacement stairs. Volunteers are hard at work: From left: Alan Bates, Gavin Spell, David Spell Jr., David Doyon, Dillon McCarthy and Mitchell Spell.